Uber’s secret weapon appears to be its booming 2-year-old food delivery service. 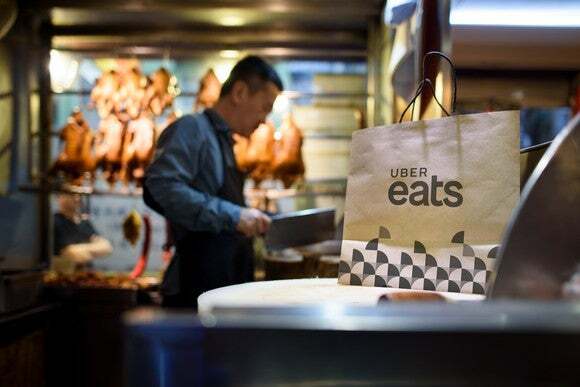 UberEats somehow has become the most profitable part of the business and will be expanding to 100 additional cities around the globe, according to a Financial Times report. Previously, Uber CEO Dara Khosrowshahi said UberEats was performing above management’s expectations, according to comments he made at the DLD tech conference in January. It’s understandable that the company wants to highlight this bright spot on its balance sheet, especially ahead of its expected 2019 IPO. The new areas of operation include 40 new cities in the U.K., 35 in France, as well as new cities in Ireland, Egypt, Romania, the Czech Republic, Ukraine and Kenya. UberEats has grown at a surprisingly fast pace in spite of the competition. Image: A chef cooking next to an UberEats takeout bag. Source: Uber. UberEats has caught on quickly. At the DLD conference, Khosrowshahi went so far as to claim that UberEats would be the biggest food delivery company in the world in 2018. “UberEats is absolutely exploding,” he said at the conference. UberEats was profitable in 45 of the over 200 cities it serviced last year, according to The Financial Times. That’s a big jump from the 3 out of 50 cities that it was profitable in the previous year. This information is in line with a previous report from The New York Times that said UberEats was profitable in 27 of the 108 cities where it operated as of July 2017. The Times report also gave a glimpse at the growth rate of the service. The rate of UberEats trips by drivers grew by more than 24 times over the 12 months between March 2016 and March 2017. That makes sense when you remember UberEats drivers are delivering from 80,000 restaurants worldwide every day, according to Uber. The speedy growth of the service largely is thanks to Uber’s previously established network of drivers, as Uber was able to use them to deliver food. Uber was also lucky that it had an established base of app users who easily could start ordering food from Uber in addition to rides. Clearly, Uber saw that it had the perfect setup to compete in the food delivery space, and seized that opportunity. And it was smart to do so, considering the global food delivery market is a $100 billion opportunity, according to a report from McKinsey & Company. Khosrowshahi’s claim that UberEats will be the biggest food delivery company in 2018 seems bold. Competition has been heating up in the meal kit and grocery delivery space as Amazon and Walmart go head to head, but UberEats is strictly in the restaurant food delivery space for now. That means it’s competing with smaller names like GrubHub (NYSE:GRUB), Postmates, the U.K.’s Deliveroo, and Germany’s Delivery Hero. UberEats still isn’t guaranteed the top spot in the space, though. GrubHub has had a particularly good run recently. For the 2017 fourth quarter, the mobile food-ordering company reported 49% year-over-year revenue growth to $205.1 million. That boost in revenue is thanks to an impressive 77% year-over-year increase in “active diners,” to 14.5 million, as well as a 22% year-over-year jump in “daily average grubs” to 334,000. GrubHub also revealed in February that Yum! Brands (NYSE:YUM), the owner of Taco Bell, Kentucky Fried Chicken, and Pizza Hut, bought a 3% stake in GrubHub worth about $200 million. As part of the deal, GrubHub will offer pickup and delivery options for Taco Bell and KFC restaurants in the U.S. This came just a month after GrubHub announced a similar partnership with fast-food hamburger chain White Castle. GrubHub is slightly different from UberEats in that it connects customers to restaurants through its online and mobile ordering system, but it relies on the restaurant’s employees to actually deliver the food. UberEats provides both the ordering platform and the delivery service. GrubHub is also a smaller operation geography wise, only operating in about 1,600 U.S. cities and London vs. UberEats’ expanding global reach. Uber’s $68 billion valuation also towers over GrubHub’s $9.6 billion valuation. However, despite the differences in size, both GrubHub and UberEats claim to work with 80,000 restaurants. Postmates is another UberEats competitor, although it’s not as established as GrubHub. Postmates, founded in 2011, is aiming for a $1 billion revenue run rate in 2018 and hopes to go public in 2019, according to a 2017 Forbes interview with Postmates CEO Bastian Lehmann. The service claims to have over 100,000 delivery drivers. Of course, the entire Uber business still is far from profitable. During the third quarter, the company lost $1.46 billion, up from $1.06 billion in the previous quarter. Meanwhile, rival Lyft only lost $206 million in the whole first half of 2017. At the DLD conference, Khosrowshahi lamented that Uber was a business that was “tuned for growth, and not for efficiency.” However, he believes Uber will be profitable in three years, according to comments he made at the World Economic Forum in January. While investors may be weary of an unprofitable company with a bad reputation, Khosrowshahi made a calculated move to highlight UberEats’ performance when he spoke at the DLD conference. Food delivery is a multi-billion-dollar opportunity for the company that already boasts 45 profitable cities in just over two years. While UberEats’ performance can’t outweigh the overall business, it’s something that Khosrowshahi may continue to focus on as Uber’s expected 2019 IPO looms nearer. Uber may not have the most attractive balance sheet, but it’s still the most valuable U.S. start-up with a valuation of $68 billion, according to PitchBook. That’s $37 billion more than the second most valuable start-up, AirBnB, at $31 billion.